Here’s a sweet way to bring the stars down to earth. Choose the birthday boy or girl’s favorite colors or match it to a space-themed party. Decorate star-shaped cookies with the Jelly Belly jelly beans or Jelly Belly Jewel Collection to add extra sparkle to each cookie. Just as fun as watching fireworks, but a lot better tasting! 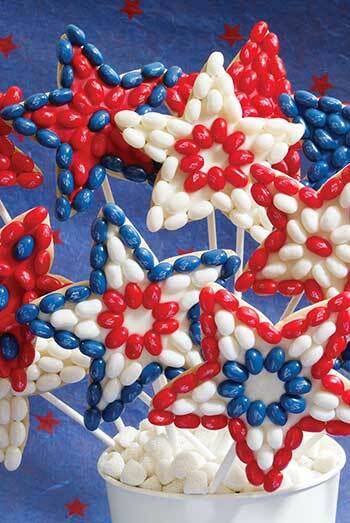 These patriotic pops are yummy sugar cookies lit up with Jelly Belly beans and Confections. A fun summer sweet! Recipe makes about 11 cookie pops. Recipe and photography courtesy of Karen Tack and Alan Richardson, authors of Hello, Cupcake! Preheat oven to 350°F. Line 2 cookie sheets with parchment paper. Knead the flour into the sugar cookie dough on a work surface until smooth. Roll out the cookie dough to a scant ¼-inch thickness. Cut out as many star shapes as possible, 4 and 5 inch, using cookie cutters. Transfer the shapes to the prepared pans. Insert a lollipop stick about halfway into the cookie dough. Repeat with the remaining dough and sticks to make about 11 cookie pops. Bake until lightly golden and firm, about 10 to 13 minutes. Transfer to a wire rack until cooled completely. Combine the confectioner’s sugar and egg white powder in a mixing bowl. Add 6 tablespoons warm water and beat with an electric mixer until smooth. Divide the frosting evenly into 3 bowls. Tint one bowl red, one blue, and leave the remaining bowl white. Keep the frosting covered with plastic wrap to prevent drying. Working on one cookie at a time, spread a thin layer of desired colored frosting to cover the top of the cookie. Arrange the Jelly Belly jelly beans in desired pattern (see photo), close together, on top of the cookie. Transfer the cookie to a wire rack. Repeat with the remaining cookies, frosting and Jelly Belly beans. Allow cookies to dry at least 2 hours. When ready to serve, fill a small vase or small pot with Styrofoam and then cover with Champagne Bubbles. Press cookie pops into Styrofoam to look like shooting stars.